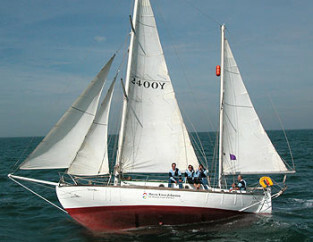 Neither born or bred in Benfleet, Robin Knox-Johnston became a member of the Benfleet Yacht Club before his famous voyage. In his autobiography “Force of Nature” he recalls that when I first brought Suhaili back from India I tried to join the Royal Medway Y.C. but was told there was a two year waiting list and besides, I couldn’t afford it. So in 1967 I joined Benfleet Yacht Club because Dad knew a member, and we laid Suhaili up in Benfleet Creek while I went back to sea. It was a nice friendly club and has stayed that way, so I am still a member there. That was the only British yacht club I had been exposed to so I had no idea what other clubs were like and was not aware that they could be a little snooty. At some stage during her stay at Benfleet the boat was advertised for sale…. unsuccessfully. This proved fortunate as Suhaili went on to be the boat in which Knox-Johnston participated in the 1969 Sunday Times Golden Globe race. This was a race to be the first sailor to single – handedly sail non-stop around the world. He duly won and became a sailing legend. There is a spinnaker pole suspended from the ceiling of the bar at BYC, reputed to be from Suhaili. True?